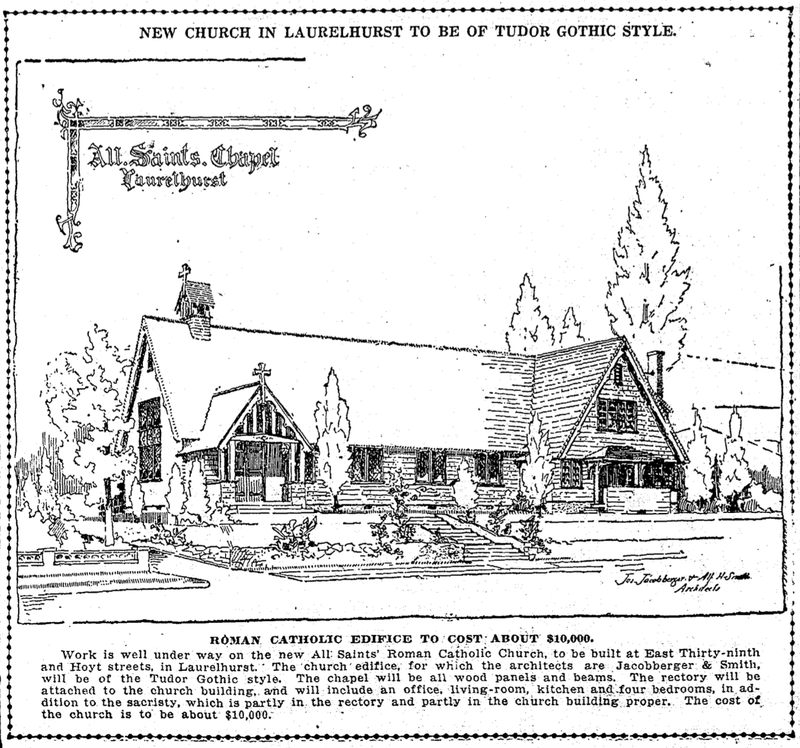 Work is well underway on the new All Saints' Roman Catholic Church, to be built at East 39th and Hoyt Streets, in Laurelhurst. The church edifice for which the architects are Jacobberger & Smith, will be of the Tudor Gothic style. The chapel will be all wood panels and beams. The rectory will be attached to the church building, and will include an office, living room, kitchen and four bedrooms, in additional to the sacristy, which is partly in the rectory and partly in the church building proper. The cost of the church is to be about $10,000. 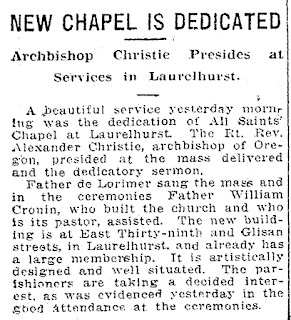 A beautiful service yesterday morning was the dedication of All Saints Chapel at Laurelhurst. The Rt. Rev. Alexander Christie, archbishop of Oregon, presided at the mass delivered and the dedicatory sermon. 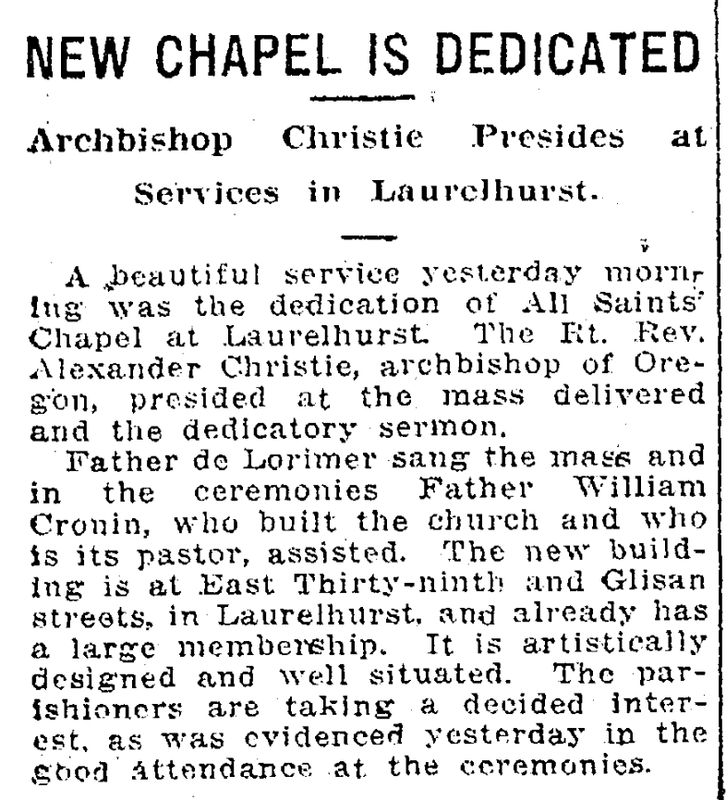 Father de Lorimer sang the mass and in the ceremonies Father William Cronin, who build the church and who is its pastor, assisted. The new building is at East 39th and Glisan streets, in Laurelhurst, and already has a large membership. It is artistically designed and well situated. The parishioners are taking a decided interest, as was evidenced yesterday in the good attendance at the ceremonies.